Chicago Church Bucks Trend; Holds Misa de Gallo At Dawn! 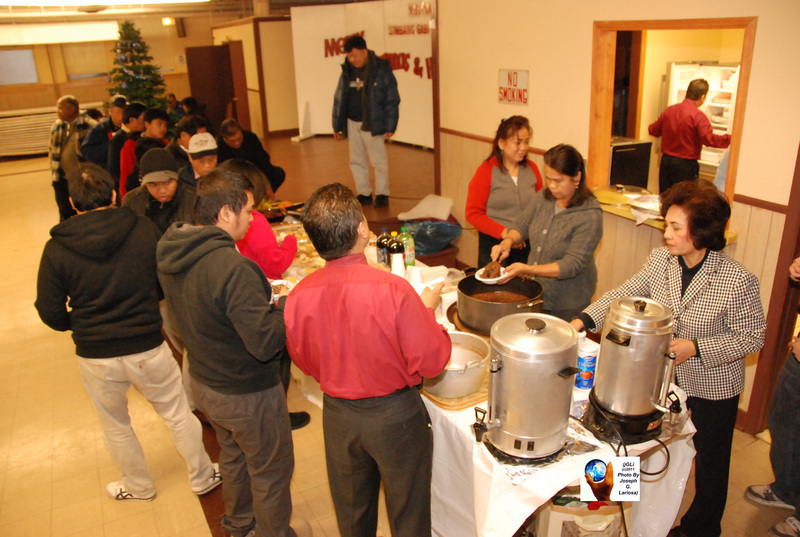 CHICAGO (jGLi) – In the run-up of Dec. 16, the start of “Simbang Gabi” (evening mass) in Chicago and around the world, Father Alfredo Salera, Pastor of Transfiguration of Our Lord Parish in Chicago’s northside, sent out word that his parish was going to hold the Simbang Gabi at early dawn at 5:30 in the morning, which is the closest as it is observed in the Philippines. In the Philippines, Simbang Gabi is held at 4 a.m. because of the tolerable weather. The timing of the mass must have sent a chilling message to the parishioners, mostly Filipinos, because of the dip in temperature around the event in Chicago. Feeling that there seems to be no takers to his plans, Father Salera, a native of Meycauyan, Bulacan in the Philippines, sent out another word that even if only one will attend the Dawn Mass, he would still hold a mass. When his church parishioner and pianist, Amor Saenz, a native of Sorsogon City in the Philippines, told this reporter about this startling schedule at the Simbang Gabi community celebration in nearby St. Gregory the Great Church last Dec. 16, my first impression was that Miss Saenz must be joking. So, at 5 in the morning on Sunday, Dec. 18, when radio newscast was telling me that the temperature was 29 degree Fahrenheit, I went to the Transfiguration of Our Lord Parish Church, at 2609 West Carmen in Chicago, some five miles away from my home in Jefferson Park in Chicago’s northside, just to satisfy my curiosity. So, when I got inside the church at about 5:40 a.m., the Dawn Mass presided over by Father Salera had started in earnest with Miss Saenz smiling at me while playing the piano. It turned out there were not only one but about 30 parishioners, who braved the very cold weather just to attend the mass that they missed attending in the Philippines. They were the same number of parishioners, when the Dawn Mass started last Dec. 16. FIRST CHURCH TO HOLD DAWN MASS OUTSIDE PH? If Transfiguration of Our Lord Parish Church will be able to hold a 5:30 a.m. for the nine-day Novena, ushering the Christmas Day celebration, it is believed to the first church located in a cold weather area outside the Philippines to hold a Dawn Mass anywhere in the world. All the 75 different Catholic churches under the Asian Archdiocese of Chicago are holding the Simbang Gabi daily from 4 p.m. to 7 p.m. at its 26th anniversary celebration this year. “I hope to keep up this same Dawn Mass while I am the pastor of this parish,” Father Salera, 65, told this reporter. “I hope my successor will continue with what I have started and other churches will follow suit” as he looks toward his retirement in five years. 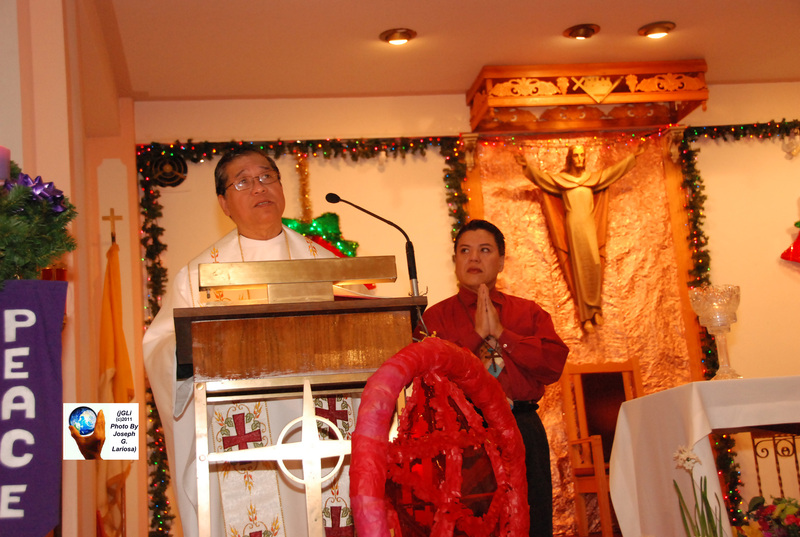 Father Salera was pastor for seven years of St. Catherine Laboure in suburban Glenview, Illinois, where His Eminence, Francis Cardinal George, the Archbishop of Chicago, will be celebrating the Simbang Gabi at 6:30 p.m. on Friday, Dec. 23. 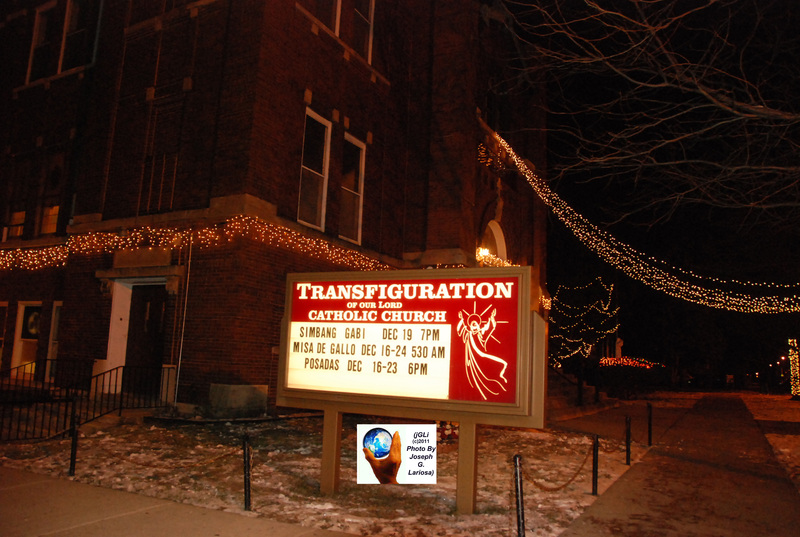 On Monday, Dec. 19, at 7 p.m., Chicago Bishop Francis Kane will be celebrating Simbang Gabi at Transfiguration of Our Lord church at 7 p.m.
Last Friday, Dec. 16, St. Gregory The Great Church in Chicago’s northside was one of the 11 Chicago churches which celebrated Simbang Gabi at 6 p.m. Fr. Paul Wachdorf, pastor of St. Gregory The Great Church, celebrated the mass in front of majority members, relatives and friends of The Filipinos of St. Gregory, a lay and voluntary organization headed by Dr. Dona L. Hernandez of Sorsogon City in the Philippines. St. Gregory The Great Church is one of the Chicago churches, which have been observing Simbang Gabi during the last 24 years. Like the rest of other churches celebrating Simbang Gabi, a light dinner for the parishioners follows after the mass. The nine-day Novena during Simbang Gabi culminates with the Midnight Mass on Dec. 24. CHICAGO (jGLi) – “Mommy” Irene Emperado, an employee of Unimart on 5845 North Clark Street in the northside of Chicago, Illinois, was scratching her head when I placed an order over the phone for 22 pounds of Galunggong (mackerel) to be fried for the Christmas party of the Bikol U.S.A. of the Midwest last Sunday, Dec. 11. Nobody should be prima donna in any organization if they want to make it strong. If there are burden sharing, everything becomes even lighter, especially the checkbook. Even Nita Payos from Gubat, Sorsogon was able to convince Salvacion ”Sally” Expectation and Sally’s sister, Lourdes Coloma, to chip in too, even if they were no shows. 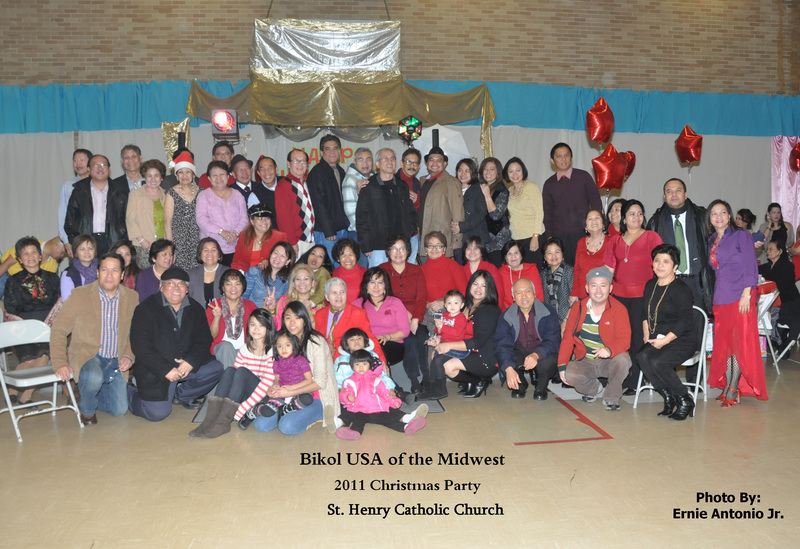 This story of cooperation and camaraderie in an organization was in full display during the annual Christmas party of Bikol U.S.A. of the Midwest headed by Ms. Evelyn R. Tolledo of Pandan, Catanduanes, as her whole family was involved in almost all facets during the party that was shared with Juzz Dance Club headed by Mr. Ed Cabanayan. 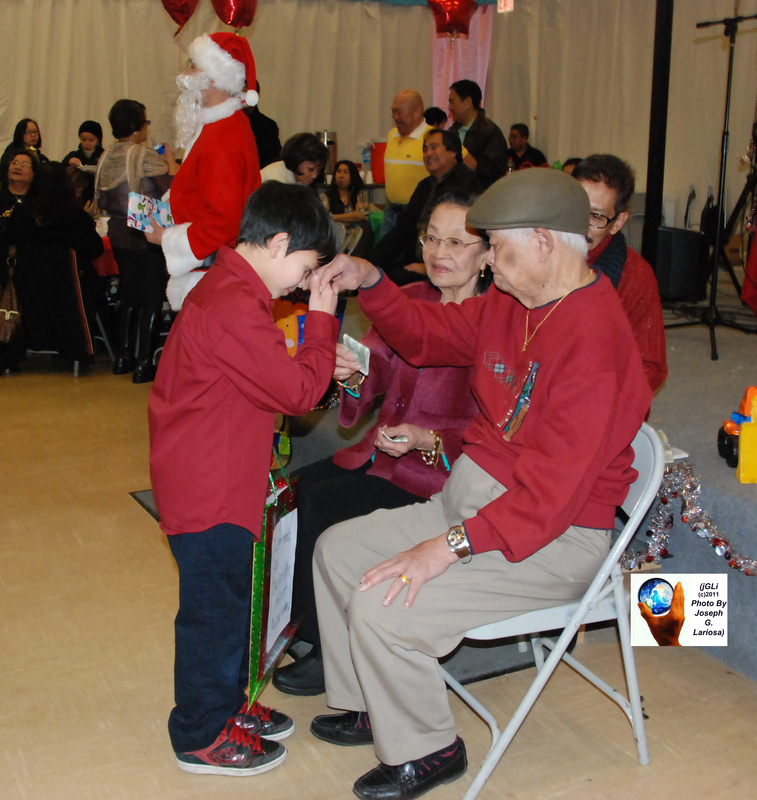 The non-stop dancing was interrupted only when Evelyn Tolledo told the crowd of over a hundred that the Bikol U.S.A. of the Midwest had donated $1,000 for victims of Typhoon “Juaning” in Bato, Bula, Buhi and Nabua, Camarines Sur; $300 for the completion of Divine Mercy Shrine and Carmelite Monastery of the Carmelite Nuns of the Holy Trinity (CNHT) in Kawakawa, Ligao City in Albay province; and another $320 for a package of three kilos of rice with six pieces of Nissin Ramen and canned goods in each of the packages to about 150 indigent families last month in Bagamanoc and Pandan, Catanduanes brought by club secretary Alice Llames plus additional contribution of $100 from Ray Galicia. As PRO of the club, I was also tasked to announce some of its upcoming events for 2012. They are the Post-Valentine Party Fund Raising for Calamansi (Citrofortunella microcarpa) Tree Planting Project at $35 per donation at Lone Tree Manor at 7730 N. Milwaukee Avenue, Niles, IL on Feb. 24; a trip to Our Lady of Snow in Belleville, IL from May 26-28; Hawaiian Luau Party on July 14 for $10 donation; BNAA National Convention, Hyatt Regency, Dearborn, Michigan from July 20-22; Annual picnic on Aug 12 at Proesel Park at 7001 N. Kostner Ave., Lincolnwoold, IL; Novena of Our Lady of Penafrancia and Feast Day at St. Mathias Catholic Church at 2310 W. Ainsle St., Chicago, IL, Sept. 7-14; Golf Tournament Fund Raising at Big Oaks Golf Club & Country Club in Pleasant Prairie, Wisconsin, Sept. 23; Halloween Party and Masquerade Ball, Oct. 17; and Bikol U.S.A of the Midwest Christmas Party and Election of Officers, Dec. 16. CHICAGO (jGLi) – A 36-year-old parolee was indicted Wednesday (Dec. 7) with 14-count murder in the brutal attack last October of Filipino American nurse Virginia Perillo before the Cook County Circuit Court in Chicago’s south side. A Clerk of Court source said that although, there was only one victim in the attack, the 14-count murder considers “different ways and intents” that contributed to the brutal killing. Raymond Harris, a resident of 7100 Block of South Yale in Chicago, was not granted bail. He will be up for arraignment on Dec. 28 at 9 a.m. at Room 101 at the Criminal Courts building on 2650 South California Avenue in the south side of Chicago. Harris, who is on parole for an attempted murder conviction, was arrested after stealing the wedding and engagement rings of the victim, Perillo, 73, and used them to propose to his girlfriend. If found guilty of murder, Harris could be sentenced to a maximum life in prison without parole. There is no death penalty in Illinois. Prosecutors said Harris, who was paroled in May, attacked Perillo as she was getting out of her car in her garage in the 3300 block of South Parnell Avenue. He stole her purse and wedding and engagement rings. Perillo, a native of Cagayan de Oro City in the Philippines, sustained serious head wounds and was found lying unconscious by a neighbor, who was trying to close her garage door that was open. An intensive critical care nurse of the Rush University Medical Center in Chicago’s southside for 40 years, Mrs. Perillo died on Oct. 24, two days after she was rushed to the hospital. Prosecutors say on the night of the attack, Harris went to a party, wearing “brand new clothes” and showed the rings to a witness, asking which of them he should use to propose to his girlfriend. Harris later used both rings. It was the DNA collected from a blood-stained men’s watch found inside Perillo’s car that matched Harris. A resident of suburban Carpentersville, Harris was arrested Tuesday afternoon in suburban Elgin, police said. When police contacted Harris’ fiancé, she turned the rings over to the detectives and Perillo’s family identified them as hers. Harris was paroled in May after serving 13 years of a 30-year sentence for his 1997 attempted murder and aggravated arson convictions, according Assistant State’s Attorney Melissa Howlett. In that case, Harris broke into a woman’s home, raped and beat her for several hours, Howlett said. He also threatened that victim at knifepoint, cut her neck and set three separate fires in the woman’s home, Howlett said. The woman woke up with her legs on fire and suffered third-degree burns. Just three weeks before that attack, Harris had been released from prison for a 1993 armed robbery, vehicular invasion and burglary. In that case, Harris brandished a gun at a woman getting outside of her car outside her home, Howlett said. Perillo’s son, Michael Perillo, 32, the youngest of Perillo’s three children, all boys, told this reporter in an interview that Chicago police found his mom lying unconscious Saturday (Oct. 22) between 5:30 and 9:30 p.m. by a neighbor, who tried to close her garage after seeing it open.